That might then open another dialog with options and allow you to save a file. In almost every case, the next user action would be to open that file with another application, for example a CSV file might be opened in Excel. But on mobile and tablets, the file system is typically hard to use and so a new concept arose. This takes the user right past the 'save to file system' step and directly opens the appropriate application with the right data. If necessary, the user can still 'save as...' that data to a file, but more likely they will just continue their work. Behind the scenes the file would be saved to some tmp folder to make it all work. In my application, users are already confused between 'export' and 'print report', and 'CSV' doesn't really mean much to non-technical users other than that they have learnt to equate it with 'Excel'. What problems do you see with this approach? 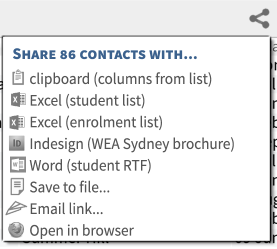 If a user chooses "share with Excel" and is then presented with a dialog to choose options (perhaps date ranges or even the export columns) does that break the metaphor? Should I keep a "share with file" option to ease the migration? Any thoughts about the UX implications of moving from Export to Share and skipping the disk saving step? Edit: I've mocked up an example of the choices you might get under 'share'. They are indicative only (the choices will depend on what part of the program you are in) but starts to show the relationship between exporting and other sharing-like activity. SHARE and EXPORT cannot be used interchangeably,and if you do so you run a great risk of confusing your userbase. Share is used to SHARE information online with other people. For example: saving a photoshop work will give you a psd file,exporting is used to get other SHAREABLE formats. Mobile applications are tricky,but in my opinion saving a file goes FIRST then you can have a dialog whether or not you want to SHARE the file. Not the answer you're looking for? Browse other questions tagged desktop-application files or ask your own question. Renaming a file you are currently working in, why is this still not done? Menu organization : conventional or domain-specific? Desktop: Placing warning labels inside a Save dialog vs. popping-up a new window?